Upon my departure from college and as I approach entering the real world...a great way to keep in touch with friends and family. Although I will be living farther away...you will all be closer to my heart. Travel yesterday was smooth as silk. I spent most of the flights sound asleep...Orlando to Chicago and Chicago to Des Moines. Managed to wake up and collect my bags, pick up my rental car, and find my hotel in West Des Moines. It was only when I was sitting ON the plane in Orlando that I realized I left my new Garmin in the glove compartment...why did I get that thing if I can't remember to take it on my trips!!! Oh well, I picked up a map from the Enterprise people, asked a few questions, and managed to make all the correct turns. I'm here at the brand-spanking-new Holiday Inn and Suites, just down the road from the race site at Raccoon River park. It's going to be a big weekend in Des Moines! I'm flying out on Thursday morning, from O-Town to DSM, renting a car, and checking into my hotel. Like always the pre-race meeting will be at 5pm that afternoon so hopefully I can check out the course and race site between recovering from traveling and unpacking my bike. On Saturday morning I'll be doing all my race-day rituals including getting a good breakfast, a good warm up, and trying to stay relaxed. The women's World Cup event starts at 12:30pm, smack-dab in the middle of the day! My only hope is that it can't possibly be as hot out there as it has been in Central Florida for the past 4 weeks...I might have a chance of being properly acclimatized! The race will be a great one, like always. The World Champ Series event in Washington, DC was amazing last Sunday. I'm so proud of my American teammates for rocking some break-aways on the swim and bike legs...check out the 5 minute videos on ITU's website! All the foreign athletes are in America for the combo of races and our start list is packed! Click here to check out who I will be racing! After the race I'm going to have to limit my crazy cheering of the men's race like I always do...whatever energy I have left will need to be conserved for Sunday's event. 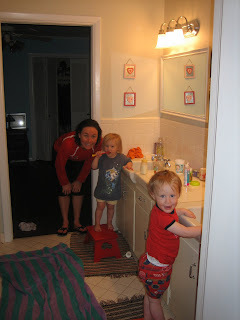 I am on a relay team with Matty Reed, Andy Potts, and Laura Bennett for the World Team Champs. ITU posted a fun press release about the potential team line ups for this event. Although the World Team Champs has been hosted before, it will be an entirely NEW format this weekend. 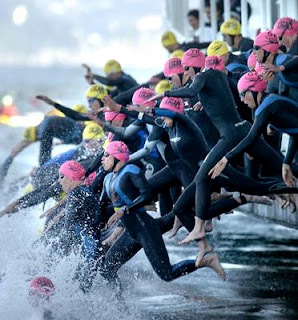 We will have men and women on the same teams...the order must be F-M-F-M. Each person completes a 250 meter swim, 7K bike, and 1.5K run (about 15-20 minutes of ALL OUT Sprinting)! 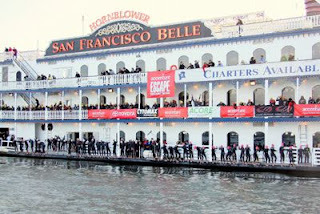 Yesterday (Sunday) morning was the 2009 Escape from Alcatraz Triathlon! I haven't been back to race this one-of-a-kind event since 2006...never fits into the schedule...but I was able to live it vicariously through Dustin and Misty! Congrats Dustin! Check out his race photos here!! I love the GATOR tri suit that he sported and the big Gator Chomp across the finish line:) Since I saved him the $350 entry fee into the race, I can sorta feel like I came across the line as the second woman...thanks Duster! Dustin is somewhere in this photo...all the men and women pros get to line up along the railing and dive into the water (for a fair start). He's somewhere in this photo too...looks like the men are in yellow caps on the far side. Remember, last month I was jumping into all kinds of water in Central Florida to film an Open Water swimming instructional video, with GoSwim Productions. It was a busy week, lots of fun, and I almost forgot all about it! A friend just asked me about the status of the video...but I have no idea so I just sent an email asking that same question. Smile and Wave...I got in the water for a 5 minute demonstration of all the drills/techniques I was teaching. Open water in the pool! Our fancy open-water-course at The Woodland's pool. 6 huge balloons, 6 dive-bricks, 1 50-meter pool, and no lane ropes. Coaches, swimmers, staff...after a long day at the pool. Teaching open water drills to use during swim practice (with lanes and walls...it can't be perfect every time). Me...and 6 'real' Masters coaches...at the 'round table' discussion on Friday night. SwimFest’09 was an event put on by United States Masters Swimming, hosted by The Woodlands team in Texas, and attended by over 150 people. I was invited to be one of the seven ‘mentor coaches’ with my specialty being open water swimming. My friend Rob Butcher is the new CEO of USMS so he contacted me a few months ago about this event and I immediately agreed to attend. I flew into Houston on Friday morning and met up with some of the other coaches and staff. We drove out to The Woodlands and met all the other coaches. A few drove in from other areas in Texas, like the amazing Whitney Hedgepeth, and we all got a quick tour of the facility we were going to be using during the weekend. It was a sparkling brand-new indoor pool, opened in October of last year. They basically gave us free-reign to do what we wanted for each of our stations…except for the fact that I couldn’t use the lane-rope-free diving-well for my OW training because there would be a diving meet going on at the same time!! I begrudgingly accepted an area with lanes and decided I would have to make-do. The evening concluded with a 2 hour ‘roundtable’ or ‘Q&A’ session with the seven coaches. We sat up at the front of the room and answered questions and gave our advice to the 45 attending other masters coaches. I was a bit out of my league…the average length of time the other six had been coaching was 15 years! The average number of swimmers they had on their team was 200! I laughed when I had to introduce myself as a 6-month coach with about 25 members on a great day…and that was before summer kicked in and everyone headed home to the north! On Saturday we had six stations set up for the 90 participating athletes to rotate through. That meant I had to give my open water training spiel six different times…in a loud pool, with a diving meet going on, and with swimmers across four lanes. And this morning, we did the same rotation three more times to a completely new group of athletes! Fortunately, I do not have to speak to write my blog! I’m going to take a few days off from talking and let my throat recover! I had a great time and enjoyed the opportunity to be a part of the first USMS SwimFest. It was a great success for the coaches that got to shadow us at each station and for the athletes that got to participate and learn. I got to see the beautiful area of The Woodlands, TX and swim in a great new facility. I’m on my way home at this moment, wishing that all the airlines would get with the program and install Wi-Fi on-board. Before I headed to Texas, it rained all week in Central Florida. I heard it continued all weekend and our namesake (the lakes of Lake County) are starting to look a little better. It’s times like these that I’m glad I chose a house on the top of a hill…I know it’ll still be there when I get home! Louie, on the other hand, I hope he’s still around and waiting to be let inside to sleep on his couch cushion. 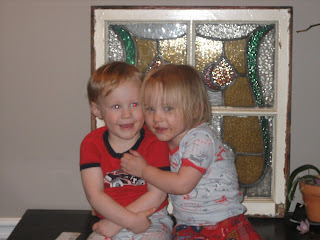 Photos of the Meyers twins...I got to visit Jess, Lucas, Rowan, and Gwyn on Thursday afternoon in Tulsa, OK. It was a short (and very straight) 75 minute drive between OK City and Tulsa. Took advantage of the race being so close...how often do I find myself in Oklahoma? Actually, that was my first, official, visit to the state. It was Green, Green, Green...and as I walked through the mud in Jess's back yard, I told her to stop hogging all the rain and send some to Florida!! As I write this, the rain has been coming down in Central Florida for three days straight, we are under flood alerts, and I haven't trained outside for the last 6 workouts!!! Would you like to receive my pre and post race "Press Releases"? Send me your email address!